If you plan on shooting a range of subjects from landscapes to intimate village scenes, you will obviously need an equally wide range of focal lengths. I usually cover from 12-200mm with three relatively fast lenses: a 12-24mm f/4.5-5.6, a 18-50mm f/2.8 and a 70-200mm f/2.8, all Sigma lenses. Fast is good. Slow lenses are lighter but suffer not only in their poorer light gathering capabilities but usually the optics are not of the same quality as an equal focal length sized fast lens. Do you really need a sub f/3.5 lens? Again, if you are not planning on shooting a variety of subjects, then perhaps not. But I have often found that the extra stop or two, coupled with image stabilization and medium-to-high ISO will land you acceptable shots in those dim churches and dusky dark labyrinthial alley ways of ancient villages. What about primes? With some exceptions (below paragraph) leave them home. Great for one mode of shooting, they are too limited for most travel photography. The above is my basic and essential lens kit. With these 3 lenses I will usually shoot around 90+% of a trip’s worth of images. With these lens, I could easily and happily “get by” but instead I typically weigh myself down a bit more. Depending upon my destination, I may pack a variety of special purpose glass. In this category I would include fisheyes. My Sigma 15mm f/2.8 yields great architectural effects and is a lot of fun in dense forests. Rounding out my “essential plus” lens kit I will often have a macro -- in my case a Sigma 105mm f/2.8 -- and more recently I also pack a Lensbaby 3G selective focus lens. All three of these lenses lend themselves to pretty specialized types of shooting, so more often than not they sit in my hotel room and only come out to play when I am in the mode for some extra creative (okay, some might say gimmicky) photography. Is it worth bringing the extra weight and bulk for a relatively small percentage of images? Perhaps not, but they are fun lens in their unique ways and sometimes that overrules the more prosaic of concerns like comfort. However, for future trips where mobility is essential (think a train ride to Lhasa), these will be the first three to stay home. In an entirely different class, on a few trips I have lugged one of two super zooms I own. Either a heavy Sigma 50-500mm f/4-6.3 or a lighter (but still massive) Sigma 170-500mm f/5-6.3. The range of both lens is exceptional: both in terms of sheer reach and in terms of limited subject applicability. One can also imagine that the weight/size of these lenses exact a comfortable-carrying penalty that further limits their consideration for trips, and you would be correct. Finally, lenses of this size require a very rigid tripod foundation (more on that later) for blur-free images. So, these big boys only travel overseas when my research tells me that there are going to be some very good photo ops for them. Wildlife is obvious -- such as these extreme close-ups of puffins in Iceland -- but less intuitive may be the capture of architectural elements such as gargoyles on the St. Vitus cathedral in Prague. Speaking of telephotos, a word on teleconverters. Love the concept: a lightweight and compact method for gaining between 50% and 100% more focal length. Downside? Expect not only a loss in available light but more importantly you will take a hit in image quality. Notwithstanding this, I currently always pack a 2x teleconverter on my trips. It is rarely used, but it is so compact that I can bring it and be assured of the extra focal length with little penalty to my bag (or back). Ideally, I would love to find a fast (defined as <=f/3.5) 100-300mm (or even better 100-400mm) and leave the teleconverter AND my 80-200mm f/2.8 home. Bodies? 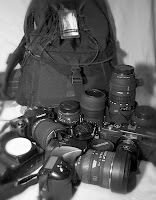 I pack two DSLRs: currently the 14MP Pentax K20 and the older 10MP Pentax K10. I’m Boy Scoutesque in always being prepared, so the K10 acts as a spare in case of damage to my primary shooter, the K20, or -- worse case scenario -- in case of loss, theft or otherwise. (This scenario actually played out -- unfortunately -- in southern France where our car was broken into and I lost approx $2000 in camera gear. The upside was that a) I had a spare and a couple of lens with me, b) I lost only one roll of exposed film and c) it finally convinced me to migrate to digital.) However, the 2nd body doesn’t always sit lonely in the hotel room. Often I will mount another lens and go armed into the streets of a mediaeval village with a super wide zoom (say, the 12-24mm) and my 80-200mm. This allows me to easily and quickly capture a wide variety of scenes and shots without having to change lenses. I also pack two other cameras. I do a lot of infrared digital photography and have recently converted an older Pentax DSLR (the *istDS) to an IR-only camera, courtesy of Spencer’s Camera. Subject of a future post, suffice it to say now, that this camera is my black & white vehicle of choice, so it travels with me always (usually with a Sigma 28-70 f/2.8 mounted). The other camera is the only film camera I still regularly use: a Hasselblad XPan II with a 45mm f/4 lens. I shoot transparencies with this 35mm panoramic camera and scan the film which yields an incredible amount of detail. So, there you have it…well, not quite. Add a range of neutral density filters, various polarizers, a soft-shoe mountable flash, spare cards and batteries, and now we are set, right? Almost. Ever had a dirty sensor in the field, on a trip? I certainly have and for those hopefully fairly rare occasions, I pack a small blower, the Arctic Butterfly and some sensor swaps with solution. Finally? Nope. Remember that mention of a tripod? Until recently I have packed the relatively heavy and bulky Manfrotto 440 Carbon One with a hydrostatic ball head. It’s a great carbon-fiber tripod that is incredibly sturdy but I found that -- due to its weight -- I was either leaving it home or, if it made the long voyage over an ocean, propped in the corner of my hotel room. Before this most recent trip (to Slovenia) I dropped a pretty penny for the sub 3lb. Gitzo Traveler. Wow. Unbelievably light, compact AND sturdy. For a change I found myself carrying it almost everywhere. It’s relatively unobtrusive and incredibly quick to set up, both attributes missing from the Manfrotto. Most positively, I found myself setting up for more deliberate shots, longer shots, using more of the light. Only complaint (other than the price!) is that the head is pretty weak. But at least it comes with one! I also pack the Gitzo Mountaineer monopod with a small Manfrotto ball head which at less than one pound also subs as a hiking staff. What’s left? Image storage and a good camera bag. Like with their cameras, photographers get very personal/passionate about their bags. They also go through a lot of them trying to find the Perfect ONE. It doesn’t exist, but we try to get close to it anyway. For over 7 years I have been using Lowepro’s Rover II bag for both my local day hikes and multi-week travels. After suffering damage to a lens that was bag-checked, I now carry all cameras and lens in my Rover for my flights. Yes, all four bodies, and up to 8 lenses have been (over-)stuffed in that bag. Security invariably wants to peak, poke and prod, but once they see that I am merely a scruffy photographer with a boat load of gear, they are happy to send me on my way. (Cleaning accessories, the flash, filters, chargers, spare batteries and cards, and the tripod/monopod are well packed in checked luggage. The goal should be that if your checked luggage is mis-routed, you should be able to shoot for at least a day or two with what you have carried on.) The shoulder pads on this bag are completely packed out so I am considering the CompuRover so that I can stuff my laptop in as well (instead of packing it in a 2nd carry-on, as we currently are doing). Image storage could and probably should be a whole post in and of itself. Did I say that I was paranoid about image loss? Do you back your images up at home (or your office, or wherever you do your photo work)? If you don't, then never mind. But if you are careful at home to ensure at least 2 copies of each image stored on separate computers/media perhaps even in different rooms or (gasp!) off site, then you should be equally diligent (read: paranoid) when traveling. For this reason, at the end of the day, I copy all images off of the media cards onto my laptop, then copy that day's worth of shooting onto an external drive. If you are REALLY paranoid, you will then physically separate that external drive so that if something happens to the laptop your drive will be safe (or vice versa). I especially do this when traveling (by whatever mode). If I had had all my exposed film in my camera bag when my car was broken into I would have lost over a week's worth of images. Gear can be replaced. What you've captured with that gear cannot. If you have made it this far in my post, you have probably figured out why I call this: Traveling Light(er). I am not yet traveling light, in my estimation, but certainly doing better in some ways than before. It is in my nature to always want to take more gear because there may be that ONE shot that requires that ONE piece of equipment I just happened to leave home. No doubt my mind playing tricks on me and one of these days I will get it under control. Until then, I'm the guy you are stuck behind at airport security as TSA (or the overseas equivalent) proceeds to re-empty and re-run my bag for the nth time. Sorry.